Before introducing a crop into a greenhouse remove weeds, algae, “pet plants,” and any plant and growing medium debris located throughout the greenhouse. Repair any drainage problems that may contribute to recurring arthropod pest outbreaks. Review previous pest problems and current pesticide application methods and make a note of crops growing in adjacent greenhouses or outdoors. Consider how the variety of plants to be grown in the same area may influence ease of pesticide applications and spread of disease. Inspect incoming stock as soon as possible after arrival and before plants are moved into production areas for the presence of insects, mites, diseases, or cultural problems. If feasible, quarantine infested or problematic plants in an isolated greenhouse or area so they can be treated with a pest control material before they are placed in production areas. Scout propagation areas at least every 3 to 4 days. Wash hands thoroughly or wear disposable gloves and discard them after handling any plants suspected of being diseased as poor sanitation during scouting can spread pathogens. Use yellow sticky cards to monitor flying pests. Change the cards weekly, and place new cards in the same areas of the greenhouse to track pest trends. Use potato disks to monitor fungus gnat larvae. Use indicator plants to determine the efficacy of pest management tactics and to monitor susceptible crops for the viruses (tospoviruses) such as impatiens necrotic spot virus (INSV) and tomato spotted wilt virus (TSWV). Correctly identify pests and beneficials on sticky cards and plants. Record pest numbers, location within the greenhouse, and the number of plants inspected. Each week, review the scouting records to assess the effectiveness of those pest management tactics being implemented. Review scouting records at the end of each growing season to determine which pests were problems and which pest management strategies worked. Integrated pest management (IPM) is a strategy that prevents pest damage with minimum adverse impact on human health, the environment and non-target organisms. The term “pest” refers to more than one cause of problems including diseases, undesirable insects, mites, mollusks, nematodes and weeds. In IPM programs, growers use their knowledge of crop and pest biology to take actions that reduce the environment’s suitability for pest establishment and increases in pest populations. IPM employs careful monitoring techniques and combinations of biological, cultural, mechanical, chemical and environmental or physical control. Pesticides are used only if monitoring indicates that they are needed. If pesticides are necessary, they are chosen and applied in a way that avoids disrupting other IPM practices. Previous pest problems in the greenhouse and current pesticide application methods should be reviewed. A plan of action may then be developed to eliminate these problems prior to the arrival of the crop. Prevention of key pest problems may be more easily accomplished if the grower and scout take the time to identify, analyze and correct problems before crops are introduced. Also, consider how the variety of plants to be grown in the same area may influence ease of pesticide applications and spread of disease. For example, keep seedling and cutting geraniums separate to help minimize spreading bacterial blight. 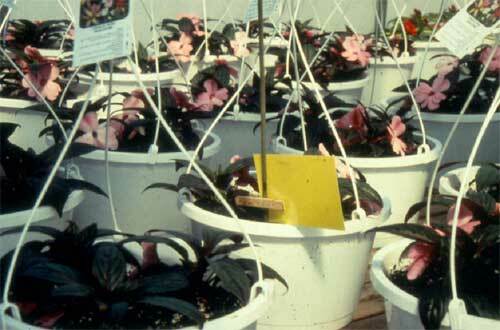 Keep propagation houses separate from other growing areas, and vegetable transplants separate from ornamentals to help reduce the incidence of Impatiens Necrotic Spot Virus when western flower thrips are present. Small greenhouses (< 4,000 sq.ft.) can be scouted as one unit. Larger greenhouses should be divided into 2,000 to 3,000 sq. ft. sections for ease of scouting. Scout propagation areas at least every 3 to 4 days. In many cases there are no specific requirements for how many locations or plants to be monitored. The number of plants inspected will depend on factors such as the value of the crop, potential problems and size and type of greenhouses. The more plants or locations inspected, the more likely the sooner a problem will be detected, when management is easiest. In practice, scouting is a compromise between thoroughness (examining everything), efficiency (putting limited time to the best use), and cost (the value of improved management information). Sampling a predetermined number of each crop increases the likelihood of locating “hot spots,” which are areas with high arthropod pest populations. Take advantage of previous experience by focusing on plant species that tend to be susceptible to arthropod pests. One way is to spend a predetermined amount of time per area of growing space, such as 5 to 10 minutes for each 1,000 square feet of growing area, inspecting 20 or more randomly chosen plants. In addition to random selection, targeted scouting is a way to assess anticipated problems or problems that are known to exist. One approach is to use a combination of random and targeted scouting. Use each method to sample the same proportion of plants each week. For example, one-third of the plants could be randomly selection, while the other two-thirds are known or suspected to have problems. Scouting should begin at the major doorway, which is usually an entry point of pests. Special attention should be paid to plants around any openings in the greenhouse. Scouts should walk every aisle and move from bench to bench in a snake-like manner. Plants should be inspected on every bench. Examine plant parts in a systematic manner. For example, begin with buds or flowers, then inspect new growth, younger leaves, older leaves and finally basal stems. Examine leaf axils and the tops and bottoms of leaves. Many pests prefer the undersides of leaves or inner, protected plant parts. Use a 10X, 5X or 20X hand lens to facilitate observation. If the plants are small, the sample unit may be an entire plant; for larger plants the sample unit may be a set number of shoots and leaves, such as 2 to 6 per plant. Hanging pots should also be inspected. For at least several plants in each section, examine roots for root decay, root-feeding insects or other problems. Follow the same pattern of inspecting each plant every time. Wash hands thoroughly or wear disposable gloves and discard them after handling any plants suspected of being diseased as poor sanitation during scouting can spread pathogens. Yellow sticky card used to detect flying insects. Each yellow sticky card should be numbered and cards positioned throughout the greenhouse in a grid pattern. Use approximately 3–4 cards per 1,000 ft2, or a minimum of one card per 1,000 ft2, with additional cards placed near openings such as doors, vents, and sidewalls. Use clothespins and stakes to vertically attach sticky cards just above (4–6″ or 10–15 cm.) the crop canopy. As plants increase in height, move the sticky card upward (vertically) on the stake. Blue sticky cards are also attractive to thrips (and even shore flies) and may be used to detect low thrips populations on susceptible crops (e.g., impatiens and begonias). However, thrips and other insect pests captured on yellow sticky cards are easier to observe than on blue sticky cards. When monitoring for fungus gnat adults, place yellow sticky cards horizontally or flat, near the growing medium surface because more fungus gnat adults will be captured compared to placing sticky cards vertically above the crop canopy. 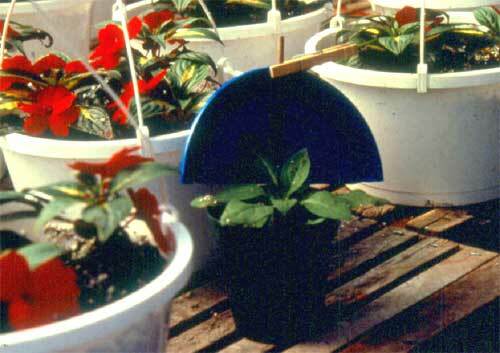 Potato disks are used to monitor for fungus gnat larvae. Cut a fresh potato into disks 1″ (2.5 cm.) in diameter and ¼–½″ (0.6 to 1.2 cm) in thickness; then press the disks into the growing medium in tagged or flagged pots. For plug trays, potatoes may be cut into small “French fry” shapes or wedges and inserted into the growing medium. In general, use 5–10 potato wedges per 1,000 ft2 of greenhouse production area. After two days, inspect the undersides of the potato disks and/or wedges for the presence of fungus gnat larvae, which have distinct black head capsules. Record the number of larvae located on each potato disk or wedge, and those present on the surface of the growing medium. Indicator plants are typically used to determine the efficacy of pest management tactics or to monitor for the viruses (tospoviruses) such as impatiens necrotic spot virus (INSV) and tomato spotted wilt virus (TSWV) vectored by the western flower thrips (Frankliniella occidentalis). Before implementing any pest management strategy, select and tag (or flag) the leaves or stems of 1–5 infested plants per 1,000 ft2. The tagged plant allows the scout to easily recognize it from a distance. After implementing any pest management tactic, inspect the indicator plants to assess if arthropod pests have been killed and evaluate the effectiveness and longevity of control. Petunia used as an indicator plant for INSV. The detection of the viruses transmitted by thrips involves the use of either dwarf fava bean (Vicia faba) plants or ‘Summer Madness’ petunias. Position a blue card with the sticky portion covered near the indicator plants in order to attract adult thrips. Blue plastic picnic plates (photo) cut in half work well in place of a sticky card to attract adult thrips. If thrips adults possess any tospovirus, a brown, necrotic spotting will be observed near white feeding scars on the plants within 48 hours. Rogue out any infected petunia or fava bean plants so as to remove any potential virus sources. Virus infections are systemic in fava bean but not petunia. Each time the crop is scouted, record arthropod pest numbers, location within the greenhouse, and the number of plants inspected. Record arthropod pest counts by date, in a notebook or on a form so as to track population trends over time. Pest Management fact sheets. Data on arthropod pest abundance, location within the greenhouse, and population trends (increases, decreases, or stable) help determine the effectiveness of pest management tactics. Each week, review the scouting records to assess the effectiveness of those pest management tactics being implemented. Early detection of arthropod pests helps prevent the need to deal with extensive populations that may cause crop damage. Pest numbers recorded from sticky card counts and foliar inspections, the use of indicator plants, and located reservoirs of pests will help to prioritize a pest-management strategy. When problems are detected early, better pesticide coverage may be achieved due to a smaller canopy, and problem areas can be identified and treated, reducing the need for blanket pesticide applications. Also, “green pesticides” and biologicals may be more successfully incorporated into the pest management program. Over time, growers will determine their individual threshold for a given pest. One grower may accept 10-15 thrips per sticky card per week, while another grower with a history of Impatiens Necrotic Spot Virus will not accept 5 thrips per sticky card per week. It is also helpful to review scouting records at the end of each growing season to determine which pests were problematic and which pest management worked. The weekly scouting reports and action taken is the basis for decisions about current and future pest management strategies and for judging the efficacy and cost of any management action. Greenhouses provide a suitable environment (e.g., temperature and light) for numerous biological control agents or natural enemies including parasitoids, predators, and entomopathogenic nematodes. Many natural enemies are commercially available and can be incorporated into existing greenhouse pest management programs. In general, the use of biological control is most effective in extended cropping systems such as cut flowers and vegetables, however they are also being successfully used in short term ornamental cropping systems such as annual bedding plants. Biological control is much easier to implement in a monoculture (single crop) than in a polyculture (multiple crops). Natural enemies cannot be used in the same manner as pest control materials (insecticides or miticides). Pest control materials are typically applied after arthropod pests reach damaging levels, and when effective, the designated pest control material reduces the arthropod pest population. Using natural enemies as a curative control is less successful compared to applying them preventively. Natural enemies should be released early in the cropping cycle when plants are small, arthropod pest populations are low, and before crop damage occurs. Releases of natural enemies may be required throughout the growing season in order to sustain arthropod pests at low populations. A biological control program can succeed if these recommendations are followed: 1) correctly identify all arthropod pests, 2) purchase natural enemies from a reliable biological control supplier, 3) make sure there is a consistent supply of high quality natural enemies, 4) emphasize that proper shipping procedures be followed, and 5) obtain directions from biological control suppliers on proper release rates and timing of application. Start any new biological control program in a small isolated greenhouse, in propagation houses, or in a greenhouse where edible crops such as herbs are being grown. This approach allows you to gain experience and then have the opportunity to expand into other production areas. It is critical to implement a scouting program and establish a favorable relationship with your biological control supplier early. The success of any biological control program relies on patience and a strong commitment to detail (e.g., scouting and record-keeping). Photos of biological control agents and information on using biological control can be found at: New England Greenhouse Update . Specific recommendations for biological control are also found in the current New England Greenhouse Floriculture Guide https://www.negreenhouse.org/ . Sources of Natural Enemies: Sources of natural enemies can be found in the reference: Suppliers of Beneficial Organisms in North America (Sacramento: California Environmental Protection Agency, 1997) at www.cdpr.ca.gov/docs/pestmgt/ipminov/bensuppl.htm . Be sure to consult your biological control supplier to determine the availability of the natural enemy species you are interested in and designated shipping requirements for them. Predatory mites are being used to prevent thrips. The mites are mixed with bran and a small pile is placed on each seedling tray. Adult mites emerge from the pile and attack early larval stages of thrips.